I’m not really sure how to explain this one, but one of our benevolent forum members managed to snap these shots of the T-Mobile “Skooter” zooming NYC promoting the new rate plans. 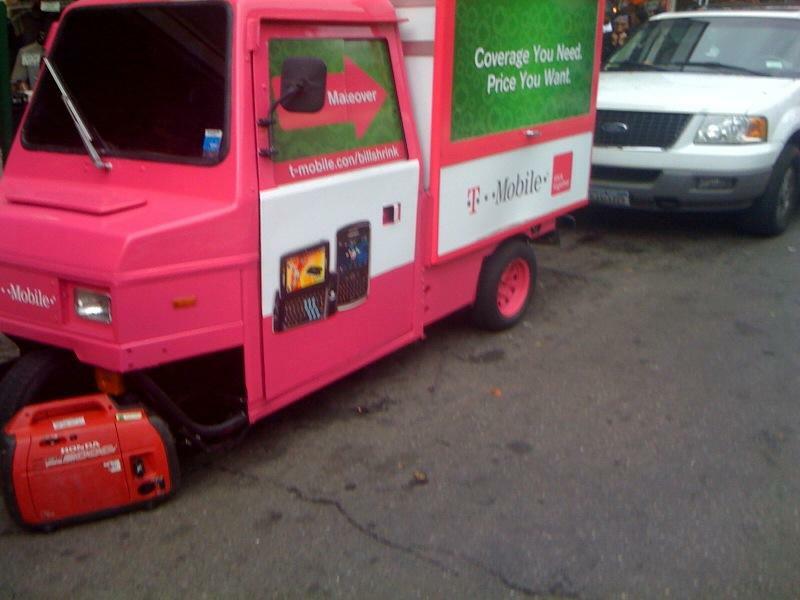 We are all hoping for a serious holiday marketing campaign for T-Mobile and I’m sure this is great for localized promotions but seriously, a Skooter? Then again, put Catherine Zeta Jones behind the wheel of one of these things and I’m signing up for as many phones as she can carry. For the record, putting Neil Patrick Harris in an advertisement for Motoblur is a major win. ← Sony Ericsson XPERIA X10 With T-Mobile USA 3G Bands?!? OMG I LOve it!!! Ahahahahahaa Go go GOOOOO TMob! also, is it me or is the front windshield tinted? how do they look at the side windows w/ the ad in the way. can’t have the front windows tinted in nyc. looks like the old ticket scooter is going to be getting a ticket. irony at its best! Why do they always have to be so trivial in their advertising? Have they tried being direct? Starting at $49.99 Unlimited celluar? love that its across the street from att. if i saw something like this i would immediately stop and stare, most likely even go up to it and attempt to get more information. its just that outrageous, and magenta. Tmobile WIN. I just want to know whether or not the Moto Cliq will be getting an Android update to 1.6 or 2.0 soon. I’m sure I’m not the only one that wants more info on this. I only have a couple of days left before I can return the Cliq. Please bring us more updates on this David and Mystic. I know we would really appreciate it. While on the bus, I snapped those pics. I jumped off the bus, just to take those pics. LOL. What’s so great about this advertising? It’s lame. Parking a cart in front of an AT&T is the best approach they could come up with. They’re genuises!!! 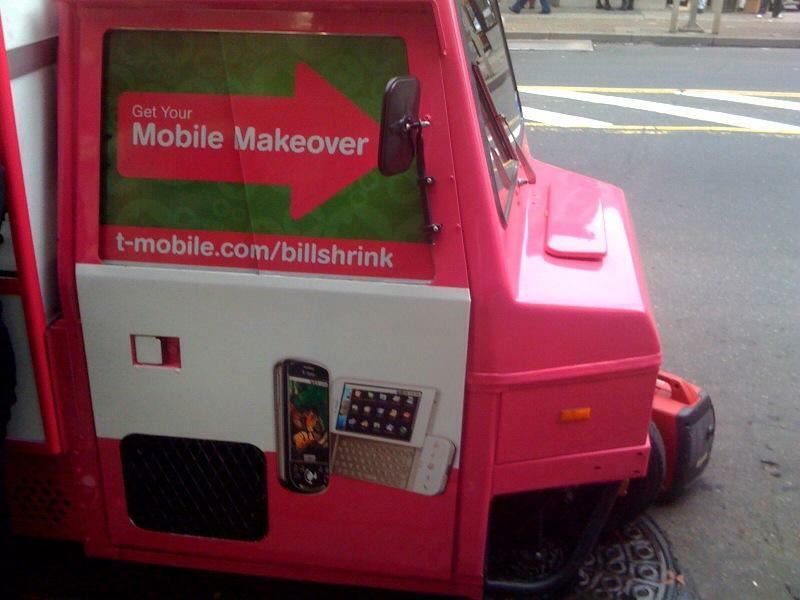 Mobile Makeover? 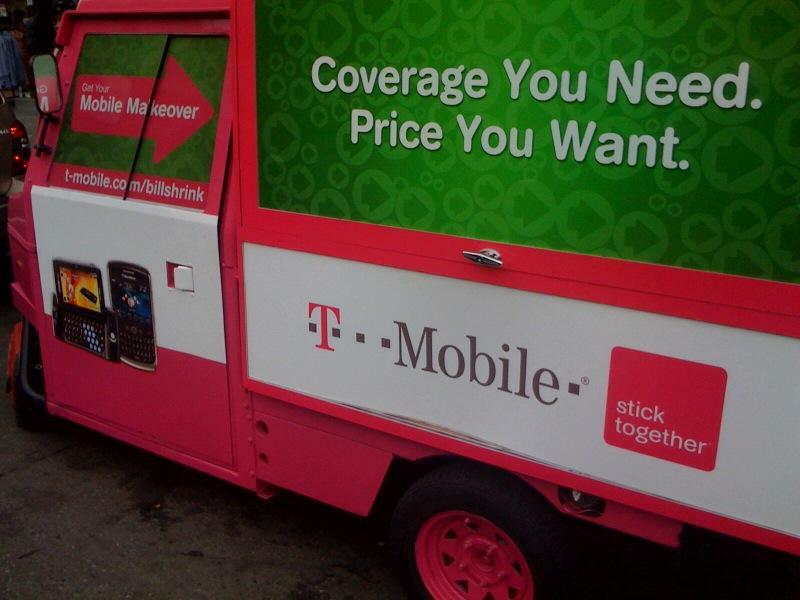 T-Mobile needs a Marketing Makeover. Gosh, can’t they stop being so g’damn lame? God bless ’em cuz I know they’ve been trying, just not hard enough. I just want to know whether or not the Moto Cliq will be getting an Android update to 1.6 or 2.0 soon. I’m sure I’m not the only one that wants more info on this. I only have a couple of days left before I can return the Cliq. Please bring us more updates on this David and Mystic. I know we would really appreciate it. Any one else with me on this? What’s up with the Cliq updates? Anyone with me on this? I want to know if the Motorola Cliq will be getting any Android updates? Anyone else interested in this? Nice tinted windshield! Go t-mobile!! ok…that’s gotta be the lamest thing I’ve ever seen. I bright pink scooter…..riiiight. Like some business man on AT&t or Verizon is gonna take that seriously while they’re rocking the Droid or iPhone. I’m so excited to see what T-Mobile has in store for us! Just last night I saw another new T-Mobile commercial advertising the new Even More Plus plans! Everyone is getting anxious for this Holiday season and phones are the best pick! I’m sure we’ll be getting several high end smart phones by the end of this year! The scooter idea was a genius! That’s AWESOME not lame… It’s really great! Thanks for the pictures Terry! Why not go search on forums and find out for yourself if the cliq is getting 1.6 or 2.0? And from what I’ve read/can remember only phone I can think of with 2.0 is the “Droid” by Verizon. I find it funny how Verizon made fun of AT&T with the “Map for that” commercial and now Tmobile parks a scooter right infront of a AT&T store. Plus when the G1 was released Tmobile made fun of Steve Jobs where the commercial was saying how the G1 was leaving some people speechless…. with the name Steve floating about some guy looking in aww at the G1. LOL. Man I guess the wireless companies hate AT&T. ^They all hate att because they have the i-phone, if every carrier had the iphone im sure it would be everywhere! all the money went to miss zeta-jones? only enough for a 3-wheeled something left? just kidding. my local t-mobile store was actually out in full force at the new york marathon and was very popular among the kids. i’m enjoying the promotional voice service outage right now. That looks like it would be the only fun driving experience in NYC. It could be a cool job to cruise around Manhattan in that thing. And, parking in front of ATT is very clever. 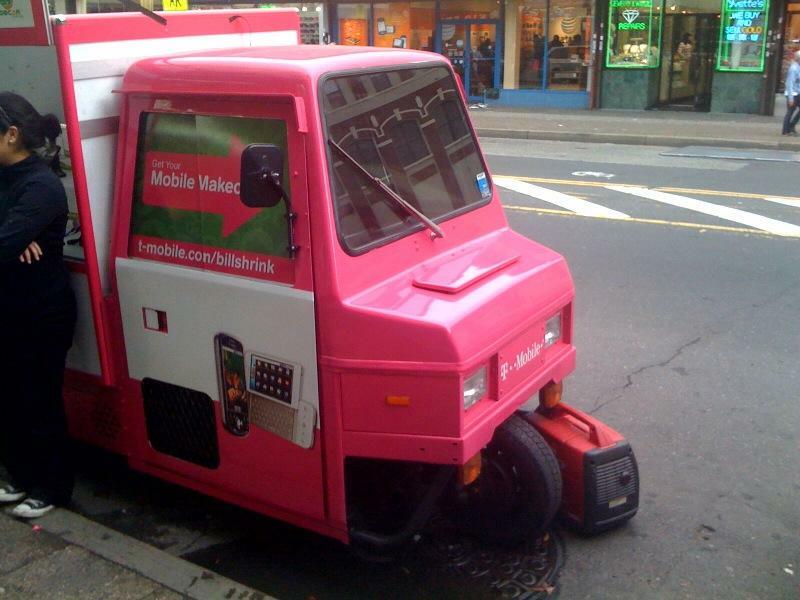 It would make so many people happy if T-Mobile got the iPhone.